Follow the only possible way (starting point x) in front of a small passage. There’s a bag on the floor, which you should take (1). From now on, you can keep items. Furthermore you’ll automatically get a ration and two aloe biscuits (you can eat those things if you lose health points to refresh yourself). Now follow the way further (you will find a few creatures in cobwebs, which you should destroy to find a little money (right mouse click)), by following the shore of a little river. Finally, you will find a waterfall. Jump onto a small projection to the left and then onto the waterfall. Once there, turn right to find a Stone of the Wise in a niche. Now jump down from the waterfall and find a lower passage in the wall of the opposite side. Approach it, duck (C-key) and go through the passage. Behind, you will find a fire crystal in a chest (open, 5). Now crawl back to the area with the waterfall, turn right and jump onto the hill (space key). You will find a rusty knife (3), which you should take (perhaps you will have to put it on in your inventory). To do this, open the bag and draw the knife while holding the mouse key onto the “hand” symbol on the left. Now follow the hill and take the book with you, which will appear to be an important item. Open it with the tab key to find a notebook, maps, etc. Follow the hill further up until you reach a cobweb (6). If you have taken the knife before and put it on, you can now destroy the webs (right mouse click). Behind it, you will find your first opponent in the shape of a spider. Hit the beast repeatedly (look down onto it) to beat it unhurt, if possible. Once you have done this, click the dead spider to get a few cobwebs. Now follow the path to the passage. On the left side, you will find a small hole in the wall. Click it to get the compass (which shows you the direction). Go further and look for other holes in the walls. Search them to find several items. After a few metres, you will get to see a short sequence, after which you will have to change the CD. Furthermore, you will now get into a new area. Having been left on the patio before the keep, turn around and click the door to get further information. As you have not been granted access, you should take a closer look at the patio (walls, fountain, etc.) to find several items. Now leave the area through one of the passages and you will find yourself on a second patio, where you will talk to a man named Dash. You will learn more about the guilds you can join. There is said to be a guild named “Bacchanal”, which you will have to find first. From now on, you can go to one of the three guilds: The clerics (Finchs), the warriors (Iron Ring) or the mages (Talamari). We will now describe the way to join all three guilds (see the guild missions). So just turn right and look for the clerics (The Order of the Finchs). Open the door and enter the patio. In the left front of the building you will find a piece of paper that tells you more about the guild (charta). If you decide to join this guild (you should enter all four guilds to acquire all skills), you have to talk to the man next to the door. Give him one silver crown (just click the guy’s belly) and you will get to now about the entrance exam: You are supposed to get some flesh of a wild boar. So leave the guild’s patio for now and you will get the “Small Healing” spell, after you have passed through the gate. Now go to the opposite side of the town and climb a few stairs. Destroy the barrels to find some items and pass through the iron gate. 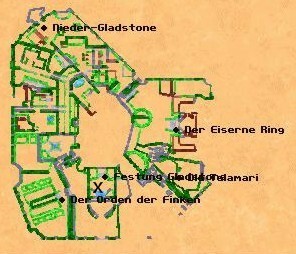 Then, approach the building behind (guild of the mages – the Talamari) and read the sign right next to the door (charta). Now try to enter the building and a mage will appear in front of you. Give a coin to the lady and she will tell you about the entrance exam: You are to get a sample of the portal in the forest. To do this, you will receive the crystal staff. Furthermore, you will get the spell “small spark”. Now go to the third guild, the warriors (Iron Ring). Read the sign there, too (charta), and talk to the one-foot guy next to the door that leads into the building. Give him a coin, too, and receive your mission: You are to free the ware house of the guild from the rats (this house is supposed to be at the docks) and receive the key to the docks. You have now found three of the guilds. Now go and look for the fourth. To do this, go down the stairs in front of the warrior guild, turn right and follow the passage to the left side. This way, you will find bars with something green glowing behind. Enter the part beyond by crawling (C-key) and jump into the hole in the ground. You will get to the catacombs automatically. Having arrived at your destination (starting point x), run in front of the bars and you will find Dash, who asks you to find the guild. He will then open the bars and run away. You will have to follow him. Mark the signs that guy has painted on the walls: A key within a circle. So follow the passage to the right and mark the map. Furthermore, you will find several bars, which you can reach via the ladders. Those bars can only be opened on higher thief levels and lead to Lower Gladstone. Additionally, watch out for the cockroaches, which will now attack you. On some walls, you can find dark rips. If you hit them with a weapon, small niches behind will open, in which you will find a chest, in most cases. These too can only be opened on higher levels. Once you have found the door to the thief guild, open it and go through. Inside, talk to the old woman and you will find a wooden coat of arms on the wall behind her. Fill it with two silver crowns and receive your mission you have to complete to join the guild: You are supposed to find the woman a knife with which she can cut her apple. This mission you can complete right away, because you just click the knife that’s in the table next to the woman. Once you have done this, you are a member of the guild and can improve your abilities from now on. Behind and on the right side of the woman doors will open. They lead to a store where you can buy weapons, armour and other things, in case you have enough money. Once everything is done here for the moment, go back to the place where you have entered the catacombs (you can also open and pass the iron gates now, which will lead you to the surface of Lower Gladstone, where you can find several stores). Once you are in front of the bars through which you have entered at the beginning, you will notice two levellers. Pull the left one down by clicking it and a ladder will come down in the room behind, which will lead you back to Upper Gladstone. Now look for the main gate (point 1) and listen to what the guard there has to tell you. Having listened to him, turn to the right wall and pull the wheel there to open the bars. Pass them to get into the forest. In further parts of the forest, you will meet little birds that may poison you. You should, as soon as you can, get yourself a de-poisoning spell, because you will need it later on in the game (the companion Syrus can heal you automatically and protects you from being poisoned). As soon as you are outside, turn left to find a few boxes. Jump and run across them to find a boar in the corner, which you can slay. This way, you will get boar flesh (click on the dead body) and have your cleric mission completed. Now cross the bridge and find a battle axe in a trunk which you can take. With that thing, even the boars shouldn’t be a problem anymore. Now follow the way until you reach an intersection (keep watching out for holes in the trees and walls to get several items), where you should turn to the right to get to the docks. Follow the way until you find a wooden fence. Continue walking along the fence until you reach a gate. This one can be opened with the key you received from the warrior’s guild. Pass the now open gate and turn left immediately. You will now find yourself in the stocks. Here you will have to kill the four small rats. Once you have done this, leave the room through the other door. Enter the next stock and kill another three rats. Leave the room and enter the last stock on the left side. In the backmost corner you will find two big harbour rats. Kill them and you have completed the warrior’s guild’s mission. Now leave the docks and go back to the intersection. Follow it into the other direction (to the Draracle. Watch out for the signs!). Now go to the next intersection and turn left to find a wild boar family and a locked up trunk, which contains another item. Now go farther along the path to the next intersection. On the right side, you will find a passage leading to a bigger area. Enter it (point 2) and watch out for the lava spots. Once you step in there or are hit by the flying ones, you will die. Therefore, save and turn left. Climb the hill and find a green cloud on the summit, which you should approach carefully (save in advance!). You must also bear in mind that you are drawn nearer by the cloud. So try to pull against it and approach carefully. If you point right at the cloud, you will see the crystal staff in front of you and you can take a sample from the portal. Now you have completed all four missions and can return back to Gladstone. Once there, go to your guilds and talk to the persons inside the buildings to join. You will start off as an apprentice and you will have to learn more to get your next missions (“the guild missions”). Inside the buildings, you can now walk around have a look at everything. You will find stores, for example, in which you can achieve several items. Furthermore, you can now choose a companion in one of the guilds. Each of these has certain abilities that match his guild. You should try each of those creatures for a short time, to see which one you like most. We played with Syrus, the companion from the thief guild, because he can heal and protects you from being poisoned. Additionally, you should know that you can return to the guilds after you have done one of the other worlds (as soon as you have killed enough monsters and gained experience) to receive new missions. There are three different ones for each guild. Completing those missions (see the guild missions) is not necessary to end the game, but it will open several rooms in which you can buy special items. After you have done everything, you can leave the town again and return to the woods. Go to the first intersection and then go left to follow the way to the Draracle. Follow the signs and your map to get there enter the cave (to enter it, you will have to join a guild first). Follow the way to the first wooden door. The small spiders can be easily killed with the Great Axe. Turn right in front of the door and push the button on the wall, which will open the door. Behind it, you will meet a few orcs, which tell you about their meeting with the Draracle. Go through the next door further north and you fill find a few Skeleton Guardians. Once you attack one of them, they will attack you. Leave them alone for the moment. Now follow the way (see map) to the bridge that leads across the river. Cross it and go through the two golden doors. Behind, you will meet a ghost (Jakel) and the false Draracle (behind the red glass). Once you have done all talks between those two creatures, continue on your way. You will learn about a teleport which takes you back to the entrance of the cave. So turn around and enter the blue glowing whirl, which is behind the open gate in the east. Once finding yourself back in the forest of Gladstone, go to Lower Gladstone (you don’t have to do this to complete the game). Once you have entered this area, go a bit forward and then left. You will find the hotel (a sign with a stag on it hangs in front of it), which you should now enter. The guy inside will say something about a rent you still owe him. Give him the 50 crowns and go left, then upstairs. Now go through the second door in the first floor and you will get into you room, where you can now store items. (take the objects lying around here). Once you have done everything, leave Lower Gladstone and go back to the forest. Look for the place where you have taken the sample of the green portal (right in the south where all the lava is – number 2). Come nearer carefully once again and let yourself be drawn in, this time. This way, you will get to a new area. Watch out fort the lava in this part and try not to fall into it. Especially on the bridge. Once the earth shakes, you should stand still to avid falling into the lava. At the other end of the bridge, you will meet an image of the real Draracle, unfolding the following mission: Go and get the Golden Signet from the Draracle’s rooms. As soon as the Draracle is gone again, it will leave a portal behind himself, which you should now approach and click. This way, you will be teleported back to the caves of the Draracle and the room where you had met the false Draracle before. Having passed the room through the open gat in the north, you will once again meet Jakel in the next room, whom you can talk to. Once you have listened to everything, open the gate behind Jakel and enter the room behind. There’s a mirror on the wall in the small niche (point 2). Go back to Jakel and talk to him until he disappears. Go back to the big room, where you had just been taken to. In this room, the passage to the south will have opened, which you should now take (point 3). Follow the hall and you will suddenly find yourself in front of an abyss leading into the lava. Approach it and – standing in front of it – turn right. You will find a button in the wall there, which will make bridges appear across the abyss. Cross them and leave the lava area. Your further way will lead to a hole, which you have to jump into. Go down the ramp behind and enter the blue hill in the last room, which takes you to another place. Follow the only possible way here and go straight on to the hole with the platform holding the rune of the Draracle in the middle. Watch out for the abyss and notice that the invisible platforms here spin around themselves. Go onto one of it and let yourself be taken to the other side. Walk onto the platform there and take the rune. Having done this, you will find yourself at another place of the cave. Approach the wall in the south which causes the stone door to open. Now go farther south (across a bridge) and two doors will open. In the last room (flames) you will meet the Draracle. It will tell you about your next mission: You are to find the parts of the mirror with the help of the rune. 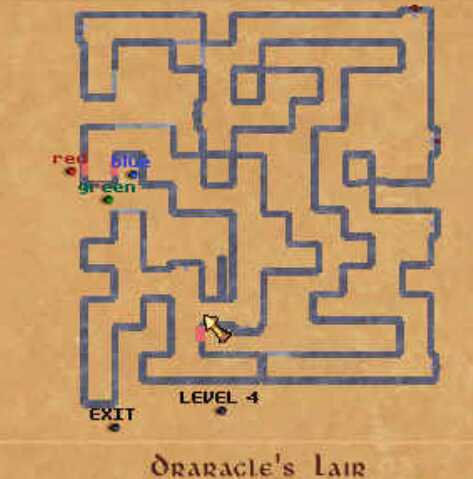 As soon as the Draracle is gone, you will find yourself back at the first part of the Draracle’s cave: In the small room with the blue hill. From here on, go back north through the lava room. Once you have met Jakel again in the starting room and he is gone again, continue to the east. Enter the blue portal again and you will be back in Gladstone Forest. Now go back to the lava area and the green portal (point 2), which you enter to be teleported to the volcano caves. Follow the now open way to the inner parts of the volcano. As soon as you have entered a larger area, which you have to cross on a narrow path, be ready to be shot at by fire beetles – kill those beasts as quickly as possible. On the other side of the path you will find a little volcano in front of the wall, which you can destroy with a few strikes (Those volcanoes are all over the caves and they have to be destroyed to move certain platforms). Now follow the tunnel (duck) to the southeast and you will get to another small area with another volcano. Destroy this one, too, and go back to the larger area. Leave it now through the other tunnel and you arrive in a high, round room. You will find a great column hat moves up and down (given you have destroyed the two little volcanoes before) in the middle (follow the path to the left). Now jump onto the column at the right moment (perhaps with a short run-up by holding the ctrl-key) and drive down. Once you are at the bottom, look north where a small way leads farther – that’s where you’ve got to jump into. Follow the tunnel and you will get into the next room. The next volcano to destroy is now directly in front of you. Destroy it to make the lava turn to stone after a while, so you can cross it and go east. In the next room, you will have to jump over a few platforms (kill various opponents), to get to the other end, a small passage in the northeast. Follow it and you will get to a huge, deep area (3). Turn to the right at the moment you enter the room and jump across the lava lake. Turn right again from the path behind it and you will find a path that leads down at the wall. Follow it, jump over a small gap and stop at the end. Look to your left and run across a small part of the lava to reach the next path in the southeast. While doing this, jump to avoid being hurt badly. Once you have reached the path, follow it to find a tunnel at the end (in the east), which leads to the next area. In the next room, follow the small path to the left side until the end, first of all. You will find a volcano to destroy there. This will make a bridge appear behind you, which leads across the lava. Cross it and find a dragon in the lava on the right side. Talk to it to get to know that this is Morphera. Speak to her until she has nothing new to tell you. Then, follow the path farther so you can leave the area again in the east. The next high room awaits you. First, follow the path to the right and enter the tunnel. Follow it and you will stand in front of a small lava lake. Go to the left until you are in front of the small volcano and destroy it. Then go back to the high room to find a few platforms in the water, which allow you to jump onto the path that leads to the top pf the great rock in the middle. (4) Now follow the round passage to the top, while jumping over a little abyss. You will find to columns that move up and down (after you have destroyed the volcanoes). Jump onto the column in the north east (maybe from the top of the big column) and from this one into the passage that leads into the mountain (5). 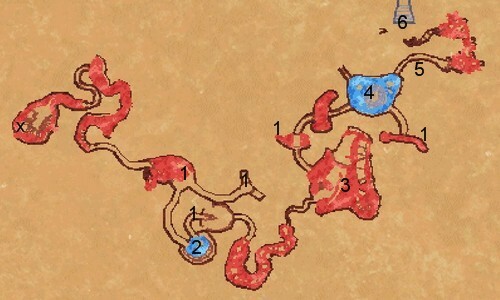 This passage will lead into a bigger area, consisting of a lava lake and two fire snakes. Now jump via the platforms in the lake across the lava and to the North West. There, you will find a ramp that leads to the next tunnel. Enter the tunnel and follow it to a bigger room (6). Kill the local monsters and approach the portal slowly from the front. There is a plate in the floor at a certain spot (you can recognise it because of the two big dragon feet traces), which opens the portal, when stepping on it. Now, keep standing on the plate until the portal has opened completely. Then, run through the portal quickly, before it closes again. Do the same with the next portals and you will finally arrive in a darker room. Kill all the fire creatures there are and approach the coloured portal. You will find two fire balls to the left and right of the portal, which you kill. Then pass through the portal (step onto the plate, wait until the 7 is open and run through). You will find yourself in a round room from which four possible passages emerge. 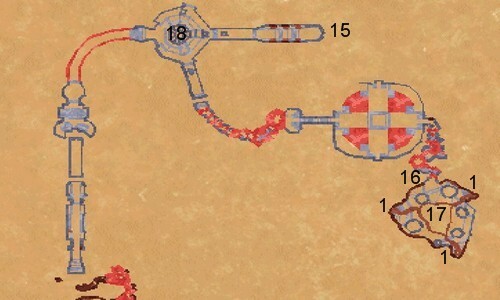 Kill the fire balls first and then follow the short passage to the east (15). There, you will find Morphera for the second time, who will have a few things to tell you and will then disappear again. Afterwards, go back to the round room and turn north this time (the following is just for further exploring of the cave and is not necessary to solve the game. Should you not want to do that, go through the door to the south immediately and continue reading here). Follow the hall to the crossroad and this one to the left (west). Enter the next room and go forward onto a dark platform. Keep standing there to go down after a while. Turn to the north and jump onto the northern stone platform at the earliest convenience. Go to the northern edge and wait for the next elevator. Jump onto this one as soon as it comes nearer and turn to the west. Now go up and down and watch for a door to appear in front of you – you have to jump to this one of course. Go through and follow the next passage to a hall. Wait in front of a dark wall there until it sinks slowly and you can enter the next hall. Watch the spot in front of you here and mark how now and then big blocks come down from the ceiling (11). Now, arrange your time in a way that you can run beneath the blocks quickly one after another, without taking a lot of damage. Wait once again on the other side until the wall has sunk and you can enter the next room. Pass through this portal to the west, too, and you will find yourself in front of a little lava hill. On this hill, you can find the spell “fire hail” (12). Climb the hill slowly, but do not yet step onto its top. Take the spell while standing on the slope and then climb all of the hill to be teleported back to the crossroad with the big eye (10). Now follow the way to the east and pass through the next door. In the next room, go to the middle and enter the big plate. This one, too, will appear to be an elevator with which you can go up (13). Turn to the east and wait until you see a door in front of you. Approach it and go through. Jump onto the platform in the middle in the next room, which opens the next door. Once this one is open, jump to it quickly and go through it. Step onto the middle in the next room and go down with the platform there. Turn to the east and you will find a gate after a while, which you approach and pass through. Follow the hall through a big lava room to the right top and you will finally arrive in a smaller room, which will turn out to be a tomb (14). Search all the rooms (mark the little hill. Once you enter it, you will be teleported back to the big eye) and you will find a big plate in one of the corners, which will take you to the top. You will find another room up there, which you have to jump into. There, you will see an altar which you can search more closely. Then, go down with the platform and enter the hill to arrive back in front of the big eye once again. Now take the way to the east again, go to the top with the platform and return to the room with the three eyes. There, you can go down with the help of the platform (13). Turn to the north and wait until you find a door in front of you. Jump to it and pass through the gate. This way, you will get to the next tomb (14), where you can also drive to the top and search the altar. Once back down, leave the room through a small passage in the west to enter the third and last tomb (14). After you have gone to the top there, too, and have taken a look at the altar, go back to the last tomb and enter the small hill to be back in front of the big eye once again. (10)	From this point, go back to the south and into the round room (1 . You will have to go back here once again if you want to complete one of the missions of the cleric guild). Pass through the southern door and follow the hall. You will finally get to another lava lake, in which you will have to get across a narrow path and several platforms to the edge of an abyss in the north. Every now and then a big platform goes up and down this abyss. Wait until this platform appears and step onto it. Go down with it and turn to the east. As soon as you are in front of a passage, jump down from it and pass through the big archway. Follow the hall into a huge, outdoor area, which you will instantly leave again – to do that, enter the hall on the opposite side. You will eventually get to the next lava area. Jump across the several platforms here to the south western corner. You will find a bigger platform there, which goes up and down now and then. Jump onto the platform and go down. Jump onto the next path on the lower level, which you follow around the corner (south west). Eventually, you will find yourself in front of Morphera (17) for the last time. She is quite angry and wants to kill you. Let the beast talk and quickly start to destroy the three volcanoes in that area (1). They are in the east, west and south, always above a little lava stream. So after you have destroyed all those three little volcanoes, the lava lake in the middle of this area will slowly close and Morphera’s strength will be reduced. You can now enter the lake and kill Morphera. We did this with the sword. Once you have done this, mark that the dragon loses a shard. But before you take this one, you should first of all collect all the money lying around her. Once you reach for the shard at the end, a sequence will follow and you will find yourself back in the Draracle’s Cave. Having listened to a short talk with Jakel, he will open a door leading to the north in this room. Go through the door and you will find yourself in a small labyrinth (x). Mark that there are platforms on the floor here, which will cause a fireball shot when you step onto them. Should this happen, just press yourself to the wall closely or run away from the fire ball. Now got to the southern east corner of this labyrinth and you will find a little button on the wall, which will open the adjoining wall if you press it (2). Go through and you will find a ladder beyond (3). Climb this one and you will get into the second level of this labyrinth (1). Here, again, it is about finding the ladder to the next level (evade the fire balls here). To do this, look for the button on the wall first. (up in the north -2). Push it to open the adjoining wall. In the next area, go to the very south west, where the ladder is (4). Right left to the ladder, you can smash the wall (3) to find the “little cure” spell behind. Besides, you can find more buttons on this floor, which open niches with items in them. Now go up to level 3 (1). Right at the beginning, you have to turn to the right, where you can find a button on the wall (2). Push it twice to let the hole beneath you move. Fall down into the second level and climb back up via the ladder. Now the way to the left is free. Search the whole level and you can find a small lock that can be opened as a thief on level one (5).Beyond, you will find the spell “little blade”. In the middle of the level, behind a door which can be opened by pushing a button, you can click the walls in the east and north to open them (4). Should you not be able to go farther at a certain spot, a spinning field is right in front of you. Just walk along the wall to get around it. Furthermore, you can only reach a certain area through a hole in the fourth level (not important) Go for the ladder in the southern area (6) and use it to climb into level 4 (1). Go along the wall at the beginning to avoid falling down through the hall. Now follow the further way to a bigger area, which is crossed by beams (2). Carefully balance across the bars to the south and you will find three coloured buttons in a small niche, which you all push (3). Now follow the hall further down the south until you finally find the spell “less light” on the ground. Take this one and follow the passage behind to the south (the spot is right in the very south west) to get back to the forest of Gladstone (6). Mark that there are now great spiders in the woods, which can poison you. Now return through the forest to Upper Gladstone (just follow the way with the signs) and enter the town (this is not necessary to end the game, so you could also skip this part). Back in Gladstone you can go to your guilds and get new weapons, armours or spells, if you need to. Now approach the keep and open the doors. This time, they will allow you in. Once you have spoken to the servant who told you not to use any weapons or magic inside the keep, start exploring the building. In the next area, you will find a smith and a trader. Now go through the door that leads north and you will get to an intersection. Keep right and go through the door. You now face the chapel, which you should enter. At the very end on the left side, you can find the “Shield” spell. On the right side, you will find a few items and on the left side stairs lead up to the next floor. Now go to the upper floor. On the right balcony you will find Luther, who will give you Tohan’s great Sword – a very good weapon! Once everything is done here, go down to the lower floor to Geron (who is in his room to the very left) and talk to him (should you be trapped, duck and take a closer look at the table to find a button – this one opens a secret passage). You can now leave the keep and Gladstone and go back to the woods: Now make your way to the next portal, which teleports you to the frozen waters. You will only find this portal now on a small clearing in the west (see map). Enter the clearing and the green cloud to get teleported. After a longer sequence you will find yourself in an icy world where everything is about finding the entrance to the White Tower (x). Follow the tunnel first and kill the worm at the end that will shoot at you. Afterwards, approach the abyss and you will find a path that leads down to the water. Follow this path and you get to the next tunnel, which leads on to the north east. You will eventually find yourself in an area with water and lots of platforms. Jump across the several platforms and try to keep north east, because there you will find a small passage that leads to the next area. Here you will face a saber tooth cat, which you can kill the easiest with the great sword. Now pass the whole area and make your way to the north. This way, you will get to a tunnel you pass through. As soon as you have left the tunnel on the other side, turn to the right and you will find the next narrow tunnel you enter. Follow this one until you are outside again. Once you have reached the clearing, turn to the right and approach the abyss (further in the front is a man you can talk to). Notice the small path that is a bit below your position. Jump to it and be careful not to lose too many health points. Follow the path along the mountain to the very north and mark the lowest passage (in the north). From this spot, you can jump onto the ground (it’s a stone soil at this spot). Follow this ground to the east and you will find a tunnel leading to the next area. Again, turn to the right once you are at the next clearing and follow the path upwards. As soon as you are on an ice bridge, look down and you will find a tunnel on the lower level that leads south. Jump down there and enter the tunnel. In the next area, jump onto the other side, kill the worm and turn to the left (east). You’ll notice a few stairs in the ice wall, which you can climb. You will get to a narrow path, where you can take a look around. You can find the next stairs you’ve got to climb on the opposite side. From this path, climb the next stairs to the top to finally arrive on the top level. Search for the tunnel that leads on to the south and enter it. This one leads to the last area. Cross the bridge here and you will arrive in front of a small door which you open and pass through (1). Finally, you are in the White Tower. Most of the doors in this building can be opened by pushing the blue buttons right next to them. All of the chests here can only be opened if you have reached a higher thief level. So if you want to plunder all the chests, you’ve got to come back later on. Right at the beginning, you will meet the queen of the amazons (1), Jacinda, who will ask you to extinguish some birds. But as you have already been told that this hag is a liar (and you will have to kill her later on anyway) you should kill her right away. Do this and search her dead body to find the Tower Key (the nests of the birds, which are all in the upper floor, should still be destroyed because those creatures will regenerate otherwise). Once this has been done, go through the door that leads to the south (right side, you can go through the door in the west before and light all the candles in the room by using the spark spell). In the following hall, wooden beams come out of the wall, which you will have to pass at the right moment. Once you have done this, you will arrive in front of a long niche and a button behind (3). Don’t push the button, because this will switch on the fire trap. Turn to the long niche instead and you will find a burning fire inside. There is a little red jewel next to the fire, which you have to grab. With this one in your inventory, go on through the door to the south and into a bigger room. There, you will find a button in the northern wall, which will open the four niches containing items in the corner, if you push it. Then, leave the room to go to the east and go through the door to the south in the next room. Open the door in front of you and you will find yourself in the sleeping rooms. Search the left side and find the violet jewel (4) on the floor under a bed. Now go back to the entry area of the tower and leave it through the left hall and the door that leads to the south. In the following room, you will find four candleholders (6). Approach them one after another and light them, using the little spark spell. Next, click on the holders and draw them to the opposite side. There are four niches. Take a closer look at the floor and you will notice a little wax stain of a particular culture in every niche. Now it is your task to put the coloured candles onto the wax stain they belong to. To do this, approach the candle as closely as possible – you will see the colour. Thus, the candles have to be placed in this order from left to right: blue, green, red, violet. Once you’ve done everything correctly, stairs that lead into a higher area will appear behind you. Climb the stairs and enter the room in the middle. On the ceiling you will find a nest of the fire chickens which you destroy. Search the nest to get the blue jewel. Then, climb down the stairs and enter the next room in the south. There you will find a little fireplace on the left side, which you can light with a little spark spell (7). Behind the altar on the eastern wall you will now find four coloured buttons, which have to be pushed in the following order to open a secret wall (see order of the lighted candles): blue, green, red, violet. The door behind will only be opened using an item which you get after you have completed a certain mission for one guild (see the guild missions). Therefore, proceed to the next room (south) and go through the door on the left (8) to enter the upper floor (at 1). Here, go to the bigger area in the north (see map) in which several fire chicken nests hang from the ceiling (2). Destroy the nests and you will get the green jewel from one of them (you may have to search the remnants of the nest). As you now have all four jewels, go to put them into the dents they are meant for. Leave this area to the west, follow the hall to the south a little and keep right at the next opportunity. Here you will find two dents in the wall, in which two of the jewels are put (3). Follow the rest of the hall to a bigger room in the northwest. There is a platform in the middle of the room. Now search the base of the platform and you will find another two dents in which the other jewels are put. 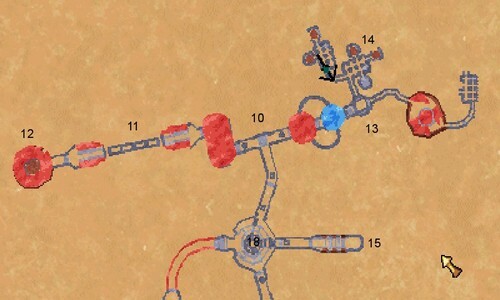 This will activate the icicle canons, which open several parts of the tower (for example at point 4). Now you can enter all these newly accessible areas and open the chests there. If you don’t, return back to the lower level of the tower. Go to the western side once again (the place, where you have previously gotten the violet jewel from) and this time enter the throne room in the very southwest (5). Open the bars here, using the Tower Key, and take the money from behind. Furthermore, you will find a shard on the wall. Click it with the right mouse key and the shard will fall off the ground. In addition, you will notice Silvertooth’s sword hilt, which you should not leave behind. Once you have clicked the shard on the floor with the rune, a short sequence will follow and you will re-appear in the Draracle’s Cave. Having inserted the shard piece and talked to Jakel, he will vanish. If you click the mirror with Silvertooth's hilt now, it will become a sword. You must now walk through all of the cave to get back to the forest of Gladstone. Here, you can either go back to Gladstone and pay a visit to the guilds and the stores or you go straight to the next realm. To do this, go to the bigger area in the northwest of the forest. Before entering the portal, talk to the guy on the clearing to get the Clock Key from him. Then, go through the portal and you will appear in the next world. In this area you will meet Shades (blue, translucent ghosts) that are hard to fight using normal weapons. Thus, you’d better kill them using spells. Having arrived in the entrance area of the building (1), keep to the left first and go through the door there. You will find yourself in a small hall which you should leave to the room on the right. Search all the shelves here to find new spells. In the upper right corner of the room you can open the wooden wall by clicking it (2). Enter the small room behind and search the shelves to find spells. You will then leave the small room and the big one through the door that leads to the west. This way, you will get into a small round-about, which you follow until you see a small shelf on the right side that contains a few note sheets – take these. You can now go through the bars that lead to west and into the garden. Once you have reached the great circus (4), a few tendrils will grow behind you and block the exit. Now search the whole garden (be on your guard concerning the winged creatures while doing that, because they can poison you) and you find a head. Take it and search for the headless gardener that should be walking around somewhere in that area. Give him the head and, after some time, he will remove the tendrils and you can re-enter the building. From the entrance hall, step through the door that leads to the east. from the hall beyond, go through the door on the left side that leads you to the kitchen. There you will find two doors in the northern wall, of which you should open the right one (5). Climb down the stairs beyond to get to the cellar (1). Kill the rats here and get to the northern part of the cellar. Jump through a hole (2) to get into a deeper room. Don’t fall through the beams into the hole here, but approach the shelf in which several bottles of wine are – take one of those bottles (or more, for food). Now open the door and follow the hall until you are in front of a ladder. Climb this one (you’ll have to jump at it first) to find yourself back in the cellar (3). Now leave the cellar and go back to the entrance hall. Leave this one to the north and you will get to a big ballroom. On the northern wall two lifts go up and down (6). Jump into one of them to get to the upper floor. Leave the lift again and listen to a short conversation with the butler of the house. Go now to the left side of this floor (west) and enter the lower door first (south). In the room behind, you will find an empty pitcher on a desk (which you take, of course). Then, leave the room again and enter the next room. Open the cupboard and take out a good armour piece (important for the next world, because it protects you from acid). Having done this, too, go to the next little room (north). There, you will find another empty pitcher on the desk, which you take, too (2). Besides, you will find a lantern on the ceiling. Click this lantern and a bit of oil will be put into the pitcher (this action is important for the next task). But do this with ONE pitcher only and leave the other one empty! Now you can get to the other side of the upper floor and pass through the only unlocked door, which leads to the east. Save in the next room and open the cupboard behind it (3). Inside, you will meet Gabriel, who asks you to put out a fire. For the completion of this mission you will only have a few seconds, so hurry. While the ghost is still talking, follow the hall to the east already, go around the corner and follow the first passage to the right. Go through the door and turn left in the next room, where you open and cross the next door. Now turn around quickly in this room and find a lantern hanging from the ceiling, where you use the empty pitcher (4). If you have done this before the fire starts, the mission is competed (because you have already bottled the oil from the first lantern before). Otherwise, just load the old save game and try again. Having put out the fire, you will automatically be back with Gabriel, who will pass the shield Death Strike on to you. Now that all has been done here, you can take your time and take a look around in this part of the upper floor. Find another few spells in the cupboards and follow the long hallway to the north. You will eventually get to an office where you have to search the cupboards, too. Furthermore, another Clock Key is lying on the desk here (5). You can now either leave the room through the door or once again go back to the room where you used the pitcher on the lantern (4), because there you will find a big window which you can destroy with your weapon. Jump out and you will get to the cemetery. Collect all items here and then go to the southernmost spot of the cemetery (you will see how – from time to time – a hole opens and closes – point 6). Place yourself onto that spot and wait until you fall down into a vault. Kill all the zombies there and wait until your father appears, whom you listen to. You can then get to the western part to the vault and click the wall, which will then open. You will then find yourself back in the cellar again (somewhere around point 2), which you leave. From the entrance area, go again to the north and into the ballroom. Approach the lifts and you will find a big clock in between them (6), where you use the Clock Key three times. Once this is done, walk around the wall behind the lifts (north) and you will find the organ player, who apparently doesn’t want to play (7). Open your inventory, click the wine bottle and give it to the organ player. Then click him with the note sheets and he will finally begin to play. Now go back to the front of the ballroom and you can watch as the two ghost couples start to dance. Watch this for a while and finally notice how the couples head for the rear part, in the direction of the ghost musician. Both couples will then vanish into a wall in the north, which will then open up for you (8). Pass through the now open wall, follow the stairs up and you will meet the butler, who will warn you. Never mind it, but continue climbing the stairs until you get into a dark room, that is full of curtains. The final enemy (the Reaper), whom you cannot see at that time, is in that room. So run quickly forward to the opposite side and you will find another clock where you have to use the Clock Key three times (lower part). This will open the windows and clear your vision. Now look for your enemy and kill him. I did this pretty fast using the Great Sword. Having defeated that foe, you will find the next shard in the floor, which you click. You will automatically be back in the Draracle’s Cave, where the shard is put into the mirror. Once again, Jakel will appear, who will have a few things to tell you. Unfortunately, you will again have to leave the Draracle’s Cave on foot. Back in the forest, you can go back to Gladstone (rest, shop or visit the guilds) or go straight on to the portal into the next world. This one can be found in a small quarry in the middle of the forest. Enter that place and you will meet a little elf who will advise you to destroy the regenerators in the next world, that keep healing the enemy over and over again. Knowing this, enter the greenish glimmering portal. Simply follow the first part of this area to the east (go through the tunnel). Climb the right slope at the end and you will get to the next circus. There is a hole in the wall through which you can reach the next area. Having jumped down (point 1), follow the tunnel to the next crossing. As you cannot jump into the higher passage to the left (west), follow the passage to the right (east) first. The passage to the north will lead back to the exit, You will finally get to an area with acid pools. If you have gotten the soft leather armour in the Underworld, you are slightly protected against the acid. Anyway, you will be poisoned slowly and you should be able to heal yourself. Your task here and in the next area will be - although you don’t have to do it, you can also just run through the area quickly – to destroy all the eggs in the acid (so less monsters can hatch) and the firing columns (points 2 – you can also destroy them with a distant range weapon). Mind that the columns leave a violet glimmer that you should avoid. Once you have finally worked yourself through to the northernmost area and destroyed everything, you will discover a dark spot in the southern wall (4). Click this one to get a Dream Splinter. You will need it later. With this item in your inventory, open the door in the north (3) and enter the next area. Jump down and follow the hall to the east. You will soon be attacked by Ru-Loi warriors here, who can shoot at you, fly and who are very quick. As these creatures can heal themselves, head for the 10 regeneration chambers first (these are marked 2) and destroy them (so try to evade those guys as much as possible). Take the location from our map and go ahead. Having arrived in one of the chambers, destroy the firing columns to the left and right at first and then approach the two steel plates on the ceiling and the floor. Look up and down there and destroy one of the two steel plates (hit it two times) to destroy the generator. While searching for the rest of the generators, look out for the yellow Ru-Loi warriors now, all of whom you have to defeat, because one of these guys will leave a hand behind after his death, which you have to take. So try to find eight generators first and destroy them all. In the north-eastern areas you will find eggs, which you can touch, on columns on the platforms in the middle. This will open platforms with items. To reach the generator rooms here, you have to jump into the specific direction from the central platform (these can be entered from the acid pools at some spots). Furthermore, you will find one cell in each the northern and southern area, which is blocked by bars of energy (4). On the left and right of these bars are dents in which you have to put a Dream Splinter (you have to click this one in your inventory first). In the northern cell you will meet an Amazon which attacks you – you have to kill her. The southern cell should be empty, it is needed for the third mission of the Mages’ Guild (see the guild missions). Once you have destroyed eight of the ten generators, head for the bigger, oval rooms in the north and south of this area. In the middle of the rooms, you will find one smaller room each, which you can enter (3). There, a plate in the ground will open (wait a while) and reveal a teleport. Enter this one and you will find yourself in the last area and before the final enemy. Now follow the passage to the middle of this level and meet the flying jellyfish-like creatures, that shoot at you with slime. Beat them to death with your sword and go to the acid pool in the middle, because this one contains the Ru-Loi collective that you have to kill. As it is immune to magic, jump at your enemy and hit it quickly with your Great Sword until it is defeated. What remains is a shard that you click. This will cause you to be brought back to the Draracle’s Cave where the fourth shard is out into the mirror. Once Jakel has sweet-talked you again, go through the cave back to the forest. Now you can decide if you want to go to Gladstone first to see what has been happening there, or if you go straight on to the last world. The portal to the shattered desert is on a huge clearing in the north-east of the forest. To get to the other side with the portal turn left first and then go to a spot where you can reach the water via a slope. Descend a little bit and look for a spot on the left side where you can enter and follow another platform. Do that and follow the way and the plateau along a narrow path along the mountain to get to enter the portal eventually. Here you will meet mutants which can poison you severely. Be prepared and work with spells and protective shields. Besides, you can climb the liana that hang down from higher platforms (just look upwards and approach them). Now follow the only possible way (starting point 1) until you reach a hole that leads into the ground. Climb down the slope to find yourself in a tunnel. Follow this one to the first bridge and DON’T jump down. Follow the next tunnel to the other end, too. Again, cross the bridge and don’t jump down. Having gone through the third tunnel, you will arrive on a larger plain where you have to watch out you don’t fall through the hole in the middle. Now turn to the right and approach the abyss. You will see a little stone plateau to the right from which a steel door leads into the mountain. You have to jump to this one with a run-up (to do this, keep the shift-key pressed). Once you have done the jump, go through the door and follow the tunnel to the other end. Jump onto the lower level here and follow the area to the very north. There, you will notice a big plateau above you, which you have to climb. Use the liana that hangs from the back part of the plateau (step close to it, look up and step forward). Having arrived on the plateau, turn north and you will find a tunnel that leads into the mountain. Follow this one, climb down the slope into the next tunnel at the other end and follow this one until the end. At the end, find a ladder leading upstairs and climb it to reach the next area. Follow this one to the end (south) and you will arrive in front of a building. Enter this one and you will meet a human being you can talk to. Having heard everything, go back to the entrance and you will find a hinged lid at the wall on the right side (still inside the building), which you can open by clicking it. This will bring forth a button you have to press. Now leave the building and keep to the right. There are bars, which you can open (click it) in front of a red light. This will make a big, red button appear, which you press. To the right, the big bars will open and a platform will come up. Now step right onto the platform and press the big, red button again to get downstairs and into the next area. Inside the building (1) you will immediately be shot by a laser device, which hangs from the ceiling. As you cannot destroy it that easily, you should run down the hall as fast as possible, then go around the corner and through the next door. Go through the gate and turn left behind it, where you have to open the next gate by clicking it. There is another laser device hanging from the ceiling here, which you should definitely destroy with your sword this time. Next, go through the little office (2). Take a look around and you will notice the bars leading into the ventilation shafts on the right side of the upper area. A few boxes are standing next to those bars. Click one of those boxes and pull it under the bars (while holding the left mouse key). There is a chair on the opposite side now, which you have to pull directly in front of the moved box (also while holding the mouse key. You can also turn the chair around in your hands). Having done this, jump onto the chair, then onto its backrest. Finally, duck (C-key) and jump onto the box, where you open the bars. Creep into the shaft and follow it to the other end. Open the bars there and enter the next room, crouching (3). Notice the blinking blue light in the upper left corner. Approach it and you will find a dark box on the wall in a corner, which you open. This will reveal a button you press. This one will open a door in the eastern wall for a short while, which you can now pass. Follow the passage behind into the next room, where you should take a look at the ceiling. You will find a few monitor hanging there, of which you have to take down to with a little spark spell. Once you have succeeded in this, take a closer look at the left wall of this room and you will find another ventilation grating. You have to put the two monitor in front of that grating – one onto the other one. Notice that there are small bars on the back of those monitors. So when you move the monitors, watch out the bars are still within reach, because you will need those to jump onto the topside of the monitors. So take a look at the drawing below and keep to it. Those moves can take a while. Having managed that finally, follow the ventilation shaft until the front of the first hole and jump into it. Follow the next shaft only until you reach the bars, in which you should smash the laser devices. Open the bars, crouch onto the grating behind and fall down into the next room. (5) Here, go to the niche in the wall that looks like a weapon. Underneath the niche is a button you have to press now (eight to nine times) until a weapon appears in the niche. Take the Thunder Staff which you can now use as a distant range weapon. Now go through the narrow gates that are between the four round rooms and notice a door at one spot that leads to the south and opens automatically when approaching it. Pass through and you will arrive in a hallway. Slowly make your way forward and notice the lasers and rocket launchers that aim at you. You should put these out now quickly. Once you have done this, follow the passage to the west first, to find another rocket launcher that waits around the corner. Approach the door and push the button on the left wall to open it. Enter the room beyond and open all the doors that lead into small rooms. There is a big robot sitting in one of these rooms (6). Click it to find the Mechanical Eye, leave the big room again (to do this, push the button on the right sight next to the door) and go through the hallway back to the eastern door. On the right side next to the door, you will find a dent where you have to use the Mechanical Eye. This will open the door and you may pass. You will eventually find yourself in the next room (7). Eliminate all the rocket launchers as quickly as possible and turn to the seven darker pieces that are hanging on the wall. On some of these things you will find a blue sign. All these things have to be destroyed (the ones with the blue sign), because once you have done this, a glass wall in the south will vanish and reveal a big hole. Jump down there and keep bouncing through the water. Under the water is the next tunnel which you have to enter and follow. On the other end, you will once again climb up a ladder. The dents in the wall (red) will take you to the surface where you have to destroy four rocket launchers quickly. Open the next door by pushing the button and enter the next hall (8). Run quickly forward into the water where hit points will be drawn from you, because the electric cables hang from the ceiling. So run quickly around the corner and pass through the next door and follow the next area to the door. Watch out you don’t fall into any of the pits there, because this would be your death! Open the next door by pushing the button and enter the big round room. Notice the round block in the centre, which you have to go around, because there is a blue force field on the southern side beyond which the next boss lingers. After this fellow has spoken a few words, the outer walls will open and reveal niches with rocket launchers. Besides, four columns have risen in the outer ring of this room. Now go to the opened niches in the outer wall first and destroy all the rocket launchers at the bottom and at the ceiling. Having done this, head for the four columns and destroy them, too, by hitting them several times (until they break). 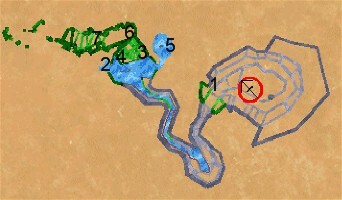 Once this has happened and all four columns are destroyed, the blue force field in the inner area has opened. Approach it and you will see several red squares. These you will now have to destroy using the Thunder Staff (to do this, each square has to be hit several times). Once a square is broken, the ground will begin to shake, making it harder for you to hit the other ones. Mind that you must not fall into the water. Having eventually destroyed all the red squares completely, the last shard will fall onto the ground to your feet. Click this one and watch the video. Unfortunately, you will be back in the room with the last boss again. You now have 15 minutes to leave the building and the whole area, because otherwise everything will be blown up. Therefore, make your way and follow our directions. Leave this room and push the button on the floor while fleeing to open the door. Cross the room with the water and the pits carefully (mind that the earth is now shaking) and enter the next area. Jump into the water there and cross the tunnel. Climb the ladder and the niches on the other side up and DON’T leave the next room through the door. Instead, discover a few red niches on the wall right to the door which you climb up to reach the platform. There you will find ventilation bars which you open and crouch through. Inside the shaft, you will have to watch out for rocket launchers and destroy them as quickly as possible. Follow the shaft to the other end, open the bars and pass through. You will land on a platform with four rocket launchers. On the right wall, you will find a yellow button that will make a bridge come out to cover the abyss as you push it. Cross the bridge and enter the next shaft. Follow this one until you see a ladder on the left side (red stairs), which you follow to the top. In the upper area, you will have to go to the west (you’d best open the map) and watch out for the next ladder to appear on the right side. Climb this one, too and watch out for bars in the next shaft. Open them and pass through to be back in the room where you have shot the monitors from the ceiling before. Leave this room through the hallway and open the next door via pushing the button. In the next room (here you have opened the flap at the blue lightning at an earlier point of time) turn right immediately to see the next ventilation bars on the wall, which you now have to enter. To do that, jump onto the elevated part left to the bars and approach it (standing on the elevated part) as good as possible. Open the bars and jump up into the direction of the bars. During the jump, you will have to duck so you can enter the shaft. This action may take a few attempts, because the shaft cannot be reached that easily. Once you have done it and you are inside the shaft, follow it to the other end and open the bars there. Crouch through and you will arrive in the small office. Leave it (to do this, open a few doors by clicking them) and go back to the entrance area of the building in the west (narrow passage). Position yourself on the dark plate in the ground, turn around and click the small bars on the ground. A red button will appear, which you press. This way, you will get back to the surface. Now follow the ravine again to the north and to its end. You will eventually arrive in front of a whole in the ground. Look down there and notice the ladder right beneath your feet. Climb down and follow the path to the very end. Jump down there to the lower level, run southwards and discover the liana which you can use to climb up to the next plateau. Follow the passage there to the open steel door and jump to the lower level. Follow the path to the south and around the corner (at a golden lake), where you will eventually once again find a liana that leads to a higher plateau. Climb up and follow the tunnel to the west. You will thus get back to the starting area of the Shattered Desert, where you can enter the now white portal. Back in the forest of Gladstone, head again for the Draracle’s Cave, Enter this one and prepare for the last confrontation. Work yourself through the cave to the now restored mirror (in the very west) and meet Jakel. He will turn out to be the bad guy and he doesn’t want to give you the seal. Having listened to his talk, you will be teleported into a new area. You will find yourself under water. Don’t you ever try climbing the ladder in front of you, because you will die. Instead, turn around to find a rope which you can climb. That way, you will get into a room in which you will meet a fake Jakel. Kill him and the appearing Hounds (Jakel is killed the best with magic from some distance). Once you have done this, a few bars will be let down and thus allow you access to the up and down moving platforms. Take one of those up to the next level and you will see a green portal in one of the corners. There are a total three of those (on different levels). Once you enter one of them, your hit points or mana points will be restored. The third one reawakens your companion if necessary. The disadvantage of these portals is that Hounds will come out of them permanently and attack you. If you use the rune on one of them, it will disappear and there will be no more hounds – unfortunately, you can’t recharge yourself anymore then, too, so make a decision. This area consists of several levels. In most of them you will find a fake Jakel that has to be killed before the bars to the next level open. Once you are on the upper most level, you will find an abyss. Climb down the stairs and turn right in the lower area. there is a big, wooden wheel, which you have to click to make a bridge come out in the upper area. Now leave the area through a passage where – again – another fake Jakel is waiting for you. Kill this one, too, to open the bars. Now take the platforms to the upper most level again and cross the abyss with the help of the manipulated bridge now. On the other side, you will automatically be allowed into the final room. First of all, get rid of the six large skeleton creatures. Afterwards, the real Jakel will come from the ceiling and must be killed. He is quite a difficult foe, who keeps flying around and using spells on you. Having defeated him finally (best from distance), search his remains to find the longed seal. You will automatically arrive in front of the mirror, which you should approach now. Once you use the seal now, the kingdom is safe. After the credits, you are back in the forest of Gladstone. Walk into the direction of Upper Gladstone (at the crossroad left) and you will meet the traitor Geron, who you talk to. After babbling with him for moment, kill him to really finish the game. The following guild missions do not have to be completed. You don’t need them to reach the goal of the game. Should you do them anyway, you will improve in various abilities, which means you will become stronger and more adept with the magic. Furthermore, new rooms inside the guilds’ houses will open time after time, allowing you to purchase better equipment. In our walkthrough, we described how to enter all guilds. If you want to, you can also decide for one or two guilds only. In this case, you will reach the higher ranks faster. However, the advantage in joining all guilds is that you are trained in all your abilities – slower, but effective. Therefore, we would advice to visit all the guilds, so you can open chest as a thief, fight well as a warrior or use spells as a magi. Have you done the first tasks of the guilds, you can join, which would actually be enough already. So if completing the missions seems too hard for you, just don’t do it. All that counts is that you have joined. To receive the next missions, you will have to gain experience first. Come back to the guilds after “completing a world” and defeating its boss for that reason and talk to the master. Once this is done, you can choose a companion from one of the guilds. Each of these companions has the strengths of its guild. The magi companion for example can cast spells perfectly and supports you in battle. The warrior companion is a perfect fighter and defeats your enemies. The companion of the thief guild heals you and protects you from being poisoned. Have you chosen one of those creatures, open the inventory and look at the upper right corner. There you will now find your companion. Around him, there are different fields that activate certain abilities. Experiment with that a bit. Should your companion ever die, go the clerics to have him rise again. The first mission – cleaning the docks off the rats – we have already described in the walkthrough. Having completed the White Tower, you will receive the mission to get an artefact from the tower. You will get and key and you will have to take the long way back to the Tower. 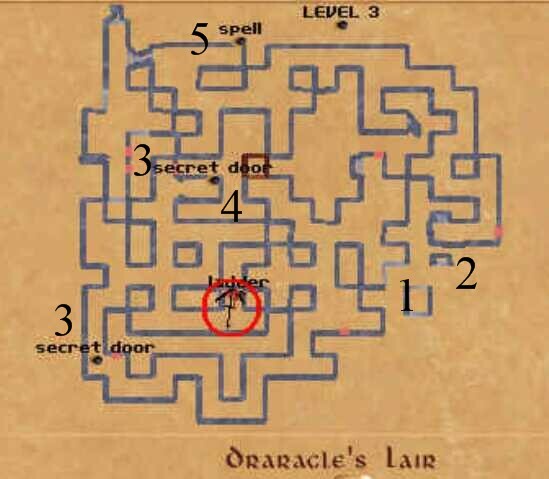 Once there, search the lower floor for the room with the for jewels, which you have pressed in a certain order before (see walkthrough) to open a secret passage. Behind there, you will find a locked door, which you can open with the help of the key. Enter the room behind, kill one enemy and take Chesara’s toy sword from the pedestal. Take the sword back to the guild and you have completed your mission. The first mission – getting some boar meat – has already been described in our walkthrough. You are supposed to bring the master five herbs or something like that, which are not found near Gladstone. Therefore, travel the different worlds and collect five different herbs (there will be more than enough on your journeys). Having done this, go back to the guild and give them to the master to complete the mission. You ought to find an item by the name “Heart of Sunrise” and therefore you receive the Dragon Claw Statue. To complete this task, you have to go back to the Volcano world once again. 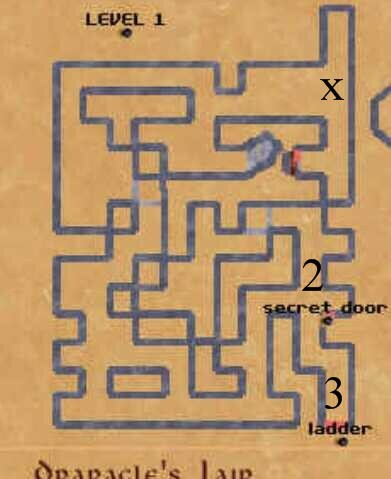 Work yourself through the tunnels till you reach the round room with the four doors (see map). Go to the pedestal and put the Dragon Claw Statue on it. This will activate an elevator, which takes you to the lower level. Once there, go through the door to find yourself in a big temple. Here you will find the Heart of Sunrise, which you take. With the help of the teleport here, you can return to the elevator. take the Statue again to be taken back to the upper level. Return to the guild and give them the item to complete your mission. The first mission – getting a sample of the portal – has already been described in the walkthrough. You are to get a sample of one of the shards. To do this, work yourself through one world, kill the boss and take a look at the shard falling to the ground. Before you use the Rune of the Draracle or take the shard, you should first use the Crystal Stuff, which you received from the guild’s master, with the shard. Having done this, you can take the sample to the guild to complete your mission. 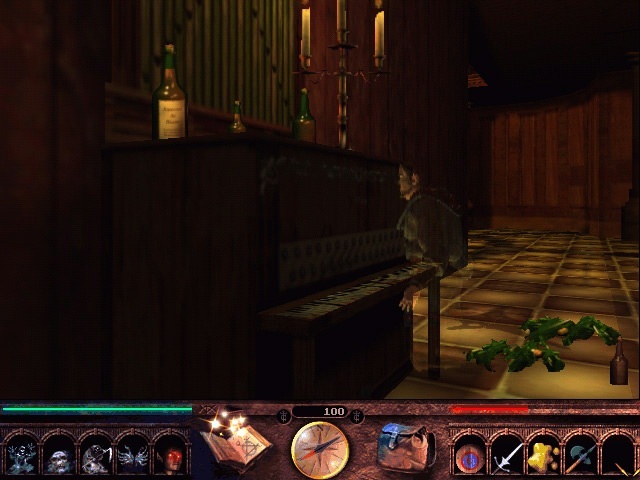 The first mission – finding the guild – has already been described in the walkthrough. You are told to steal an amnesty writ from one of the guards of Gladstone. Return to Upper Gladstone and go to the entrance of the Keep (see map). Wait in front of the gates until a guard leaves it. Approach him from behind (mind that he mustn’t notice you!) and notice that the writ you are looking for is in one of his trousers’ pockets. Take the writ carefully and return it back to the Thieves’ Guild to complete your mission. You are supposed to find out about what has happened to the food provisions. This mission is only available if you have explored one or two worlds already and the Gladstone forest has changed (other monsters and stuff). Enter the forest and keep to the northwest. In the upper most area (even above the entrance to Lower Gladstone and next to the entrance to the Underworld) you will find three orcs sitting around a campfire (now save!). Once you attack them, a fire will be lightened and the clearing will begin to burn. Now, you should first of all grab the writ dropped by one of the orcs. Should you not manage to do that in time, load the save game again, because otherwise the mission cannot be completed. Once you have managed to take the writ, you can take all your time to kill the orcs. Go back to the Thieves’ Guild and get your reward.